2 Br House on 5-acre Coffee Plantation with Stunning Ocean & Mountain Views. PRIVATE WITH LUSH SURROUNDINGS. Hacienda Vivace is located on the outskirts of San Ramón in the quaint area of Magallanes, a mix of Tico and expat residents. Hacienda Vivace and this rental, Casita Vivace, sit at the end of a country lane on 5 private acres of lush gardens and semi-tropical landscape, rolling mountains and coffee fields, overlooking the Pacific Ocean's Bay of Nicoya. The Hacienda is a spectacular, newly completed contemporary Spanish main home with the stand-alone Casita Vivace rental at its side. Casita Vivace is a separate 2-story, custom-designed house with 2000 square feet, plus front and rear patios and second story balcony, all with fabulous views. The impressive custom wood and iron work are throughout the ground floor master queen bedroom, loft area with family room plus queen bed and sofa bed, bath with both outdoor and indoor showers, gourmet kitchen, dining/living room, and laundry. The house is fully furnished and all utilities, high-speed 6G internet, and private parking are included. STUNNING VIEWS AND WORKING COFFEE PLANTATION. The property has spectacular views all around. At 3700 feet and a constant temperature in the mid-70's, the Hacienda and Casita Vivace overlook the Pacific Ocean and the Bay of Nicoya with its many islands. Visitors watch the cruise ships enter the port of Puntarenas, and enjoy phenomenal sunsets and dazzling evening lights. The surrounding mountains display lush semi-tropical vegetation. The working coffee plantation is flocked with the dramatic white coffee flowers in May and the cherry red coffee berries in November through January. The Hacienda gardens are tenderly cared for by the owners and provide an ambiance of beauty and tranquility. A HEARTY BREAKFAST TO START YOUR DAY. Breakfast can be served at an additional cost, with fresh local fruit, homemade pastry, granola and local coffee, followed by a main breakfast dish. PRIVATE CHEF AND COOKING LESSONS. If you are interested in experiencing local cuisine, you can take advantage of the Hacienda’s private chef. Whether you are looking for typical Tico fare or a gourmet dinner, the Hacienda’s experienced chef comes highly recommended. The Hacienda also offers cooking classes for Costa Rican and other cuisines. Hacienda Vivace will give you the chance to experience the real Costa Rica and ‘Pura Vida’ lifestyle, while enjoying the modern luxuries of a beautiful North American style home. We're located at the end of a private country lane on a working plantation that overlooks the Bay of Nicoya. You can bask in the early morning sunshine with your coffee on the back patio, contently sit and enjoy the view in the hanging basket chairs on the front porch, take a swim in the pool in the afternoon, and enjoy evening cocktails and sunset on the upper balcony. Pick up fresh fruit and vegetables at the weekly outdoor market in historic San Ramon just 5 minutes away, drive to one of the local waterfalls and splash in the pools, visit an orchid garden or sugar cane factory, or launch a day of site seeing to volcanoes, the beaches, zoo, animal rescue center, one of many hot springs, canopy tour, or an evening at Teatro Nacional for symphony or ballet. Another unique benefit to staying at Hacienda Vivace is the food! We serve a hearty breakfast upon request, and If you are interested in experiencing local cuisine without leaving your patio, you can take advantage of the Hacienda’s private chef. Whether you are looking for typical Tico fare or a gourmet dinner, the Hacienda’s experienced chef comes highly recommended. Downtown San Ramon is 5 min. by car with all the amenities you could want -- super markets and produce stands, shopping, restaurants and bars, museums, cathedral and town square, 3-cinema theater. Quaint village of San Ramon, the City of Poets. Rolling volcanic mountains covered with lush semi-tropical vegetation and coffee fields. Large overhead fan cools loft and main floor. Tennis courts are 5 min. from the property. Pickleball is a booming international sport. 2 pickleball courts are within 5 minutes property. 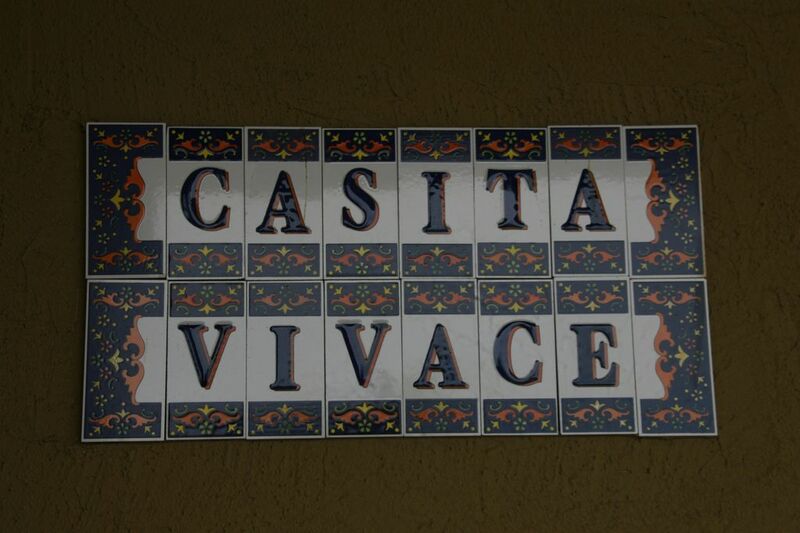 Casita Vivace is wonderful. Spacious rooms, incredible view of the valley below all the way to Punta Arenas - which is an hour's drive away. Nancy and Andy are caring and attentive hosts. If you are staying in the San Ramon area, you must choose this property! Arrive during daylight, though. Pristine accommodations with a breathtaking view! Enjoy this spacious and comfortable Casita while you explore the Costa Rican terrain. You will be warmly welcomed by your hosts Nancy and Andy, who accommodated our every need. Have coffee while taking in the view from the hanging porch chairs, greet the locals while you stroll the neighborhood, relax and read a book while lounging on the second floor sectional, and enjoy an outdoor shower at the end of the day. We had such a great time, we didn't want to leave! Best house in six weeks! This house was extremely clean with the amenities North Americans are used to. Plenty of hot water with a great outdoor shower. Andy and Nancy are gracious hosts who helped us explore the San Ramon area. Do not miss Andy’s cooking. We are already planning our next trip. You will not regret renting this house. The property was clean and everything was in good working order. The kitchen is fully equipped for cooking meals. The home is very practical with just enough space for a family of 4-6. The owners are very welcoming and accommodating. Most of the attractions we did was about a 45 minute drive away with one being 2 hours away. The views are amazing! Andy and Nancy are fantastic hosts - they provided us with lots of information and guidance - where to go, what to do!! Sunset drinks/ party invite was sooooo nice - ceviche, watermelon slushies and red wine and of course the unbelievable sunset. The casita is fully equipped with everything for a perfect vacation - even an outdoor shower and a bathtub does it get any better than that? Nancy and Andy have thought of everything. We will be back! Andy and Nancy offered a wealth of information and sightseeing ideas and were genuine and excellent hosts. Their three little dogs were delightful as well. We experienced no issues with our internet connection; a problem reported in the past but that has been fully corrected with strong, fast service. Folks should be aware that there is not a television set in the casita - this was not an issue for us, given the beautiful scenery, multitude of birds and beautiful sunsets. We highly recommend this wonderful property. Thank you Jane and Jeff. It was a pleasure getting to know you. We hope to see you again next year in Magallanes and in a couple of years as residents of CR. Within 90 minutes are attractions such as Poas Volcano, La Paz Waterfalls & Gardens, La Fortuna hot springs, Lake Arenal, Carrera National Rainforest, Sarchi, Puntarenas, Zip-Lining, Butterfly Farms, Animal Rescue Centers, Manual Antonio Biological Reserve, and much more. The nearest beach is just a 30 minute drive away, where capuchin monkeys come down from the trees to join you for lunch.